For many learning how to make Christmas cookie recipes which have been handed down through generations has been a tradition celebrated around the world. Wherever Christmas is celebrated getting together with family and friends for cookie baking is a perfect holiday activity. Every holiday has its own unique fragrances and tastes. Christmas is a season of warm spice scented kitchens with family and friends gathering around to indulge in freshly baked cookies. From the first of December to New Years Day so much of what we do is a result of traditions celebrated by our families throughout the years. Many of us have added new traditions to the old ones. Learning how to make Christmas cookie recipes and many other delicious recipes have always been among my family’s traditions. As a child, I tried hard to change some of my dad’s family’s traditions; one which comes in mind is about his Christmas tree tradition. Dad believed and was accustomed (due to his German ancestry) to putting up a live Christmas tree on Christmas Eve; and not before. Also, nothing was ever under the tree until we woke up on Christmas morning. We didn’t get a lot of gifts but under the tree were large baskets of oranges, apples and all kinds of candy. These were things that we didn’t get through the year because of the expense so this was really great. Although I did not like the Christmas tree tradition when I was young, I realize now that we start way too early putting up decorations. I now remember our traditions with much fondness. If you do not celebrate the holidays with the tradition of learning how to make Christmas cookie recipes, start one this year. People from all generations come together to make cookies, to exchange recipes and to share their memories and traditions. 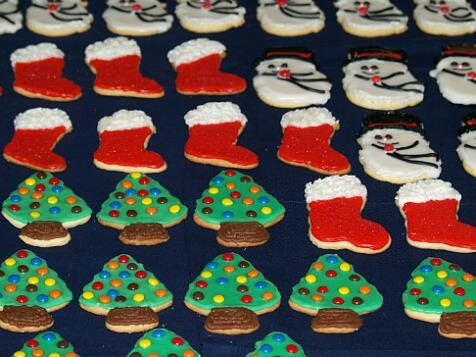 For many, annual Christmas Cookie recipes swap parties have been established for friends and families. Today we are able to enjoy traditional cookie recipes from around the world because of the wonderful availability of ingredients here in the United States. Many of my Christmas cookie recipes came from my family but I have expanded my collection over the years; all of which were recommended by family members and friends. As I collected recipes, there are some things that I considered before adding them to my collection. First I want to use a variety of special cookie ingredients for the season. This year I will be adding a bar cookie with salted nuts, caramels and chocolate in them. You must have some chocolate in your collection; everyone looks forward to chocolate. Then I like to have a variety of cookies with fruits and nuts; fruits can be cooked or dried and I use several different types of nuts. I also look for recipes with special spices in them; must have cinnamon, ginger, cloves and nutmeg for the holidays. Included in my collection are some basic tasty cookies like shortbreads for those who do not like rich sweet cookies. I like my Christmas cookie recipes to be only for Christmas; I rarely make them through the year. This makes them all special for Christmas. I like cookies which are small so they make a nice presentation when arranging them on trays. 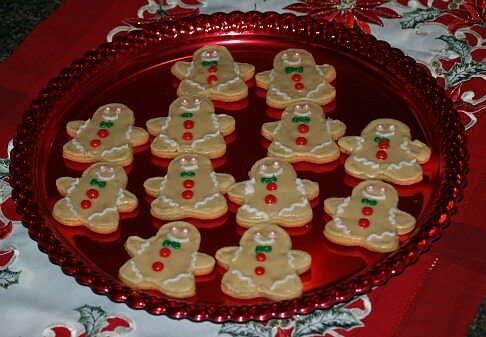 I usually add a few slightly larger decorated sugar cookies to each tray (As my garnish). I blend in a variety of shapes and colors in my cookie recipes; also adding to the presentation when arranging on the trays. If you are just starting cookie baking and want to keep it small, maybe you only want to bake one special cookie this year. For this I would recommend starting with a decorated sugar cookie. It is very tasty and everyone love sugar cookies. When they are decorated with green and red icing or sugars, they reflect the festive Christmas season. NOTE: A gadget that works well for decorating sugar cookies is an empty plastic thread spool. Simply press the spool into the dough imprinting a pretty flower design. I feel a recipe of rolled sugar cookies is necessary to include every year among my Christmas cookie recipes. 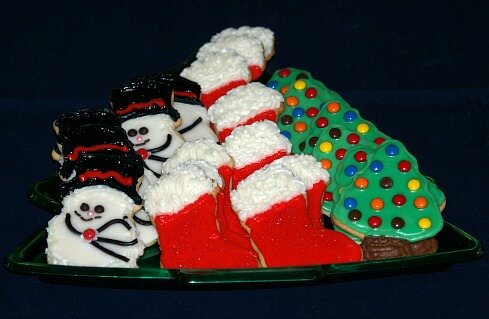 They are delicious and when this cut out cookie recipe is decorated for Christmas, they will add excitement to our Christmas menu. Combine butter, salt, grated lemon rind, nutmeg, sugar and eggs; beat thoroughly. Combine flour, baking powder and baking soda; add to creamed mixture and blend thoroughly. Shape dough into ball and chill for 1 hour or more. Roll portions of dough on floured board 1/8 to ¼ inch thick; cut with desired cookie cutters. Place on lightly greased cookie sheets and bake 8 to 10 minutes or until edges start to brown. Remove from pan to cool completely and decorate. If you are one who does not like the extra trouble of cutting out sugar cookies and spending a lot of time decorating, then add these old fashioned sugar cookies to your collection of Christmas cookie recipes. They are very good and easy to make. It is a large recipe (8 dozen) so you might want to cut it in half. Combine butter, oil and sugars; beat thoroughly. Add vanilla and eggs and beat well. Sift together flour, baking soda, cream of tartar and salt; blend into creamed mixture. Roll dough into teaspoon size balls. 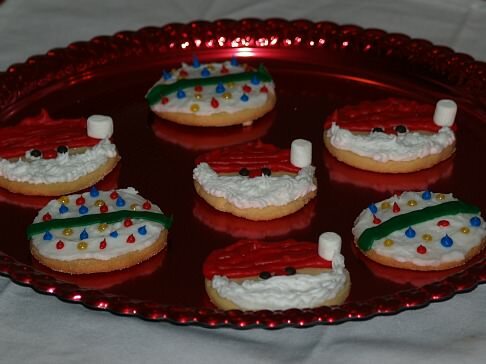 Dip tops into green or red sugar and place sugar side up on cookie sheets; press down with a glass to flatten. Combine and stir in medium bowl flour, cinnamon, ginger, salt, baking soda and allspice. In a large bowl beat butter, sugar and vanilla on medium speed until light and fluffy. Beat eggs and molasses into creamed mixture until well blended. Add flour mixture to creamed mixture and beat until well blended. Divide dough into 3 equal parts; flatten into disks, wrap in plastic wrap and refrigerate overnight. PREHEAT OVEN to 350F degrees; line baking sheets with parchment paper. Working with 1 piece of dough at a time roll on a floured surface to ¼ inch thickness. Cut with gingerbread man cookie cutter; place on prepared baking sheets 1 inch apart. Cut remaining dough REROLLING the trimmings. Bake about 10 minutes; let cookies cool completely on wire rack. Frost with ornamental frosting tinting if desired; decorate with candies. Beat butter and vanilla in a large bowl with electric mixer on medium speed. Beat in powdered sugar and enough milk on low speed until frosting becomes desired consistency. In a large bowl beat butter on medium speed until smooth; gradually beat in the sugar. Increase speed to high; beat in eggs one at a time beating until light and fluffy. Beat in orange peel and vanilla; gradually beat in flour mixture until blended. Gather dough together and form a ball; flatten into a disk, wrap in plastic wrap and refrigerate 2 hours. Shape dough into 1 inch balls; roll on flat surface to form 3 inch logs1/2 inch thick. Place logs 1 inch apart on ungreased cookie sheet; bake about 14 minutes. Melt chocolate chips over low heat in heavy saucepan; place pecans on sheet of wax paper. 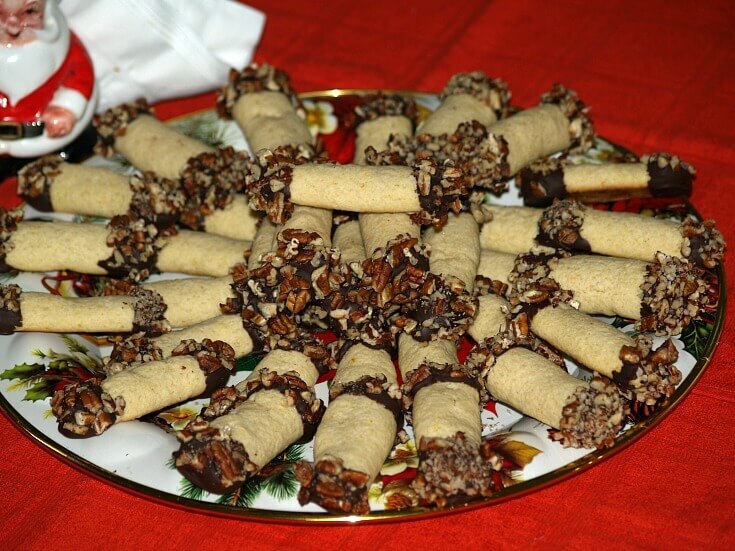 Dip one end of each cookie in chocolate; roll chocolate covered end in pecans. Place cookies on wax paper lined cookie sheets and let stand (or refrigerate) until chocolate sets. Beat butter and sugar in a large bowl with mixer until creamy. Beat in egg and lemon peel until blended; mix in flour, almonds and cinnamon until blended. 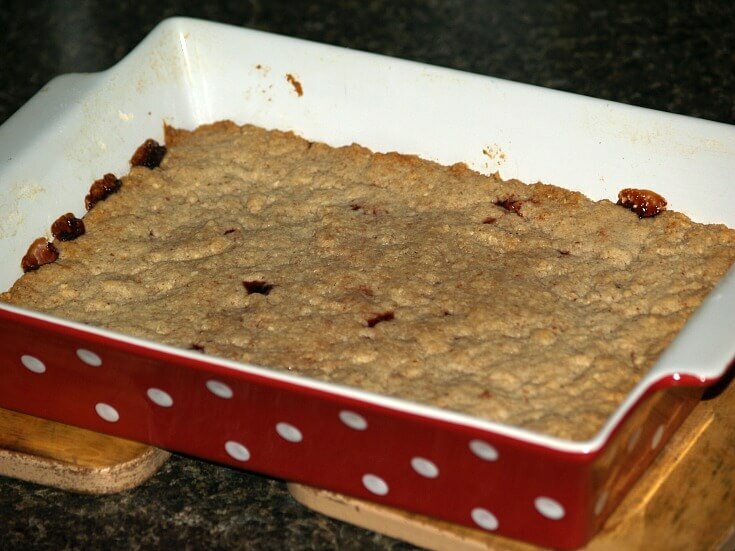 Press 2 cups of dough into bottom of prepared pan; spread preserves over the crust. Carefully press remaining dough a little at a time evenly over the preserves. Bake 35 to 40 minutes until golden brown; cool on wire rack. 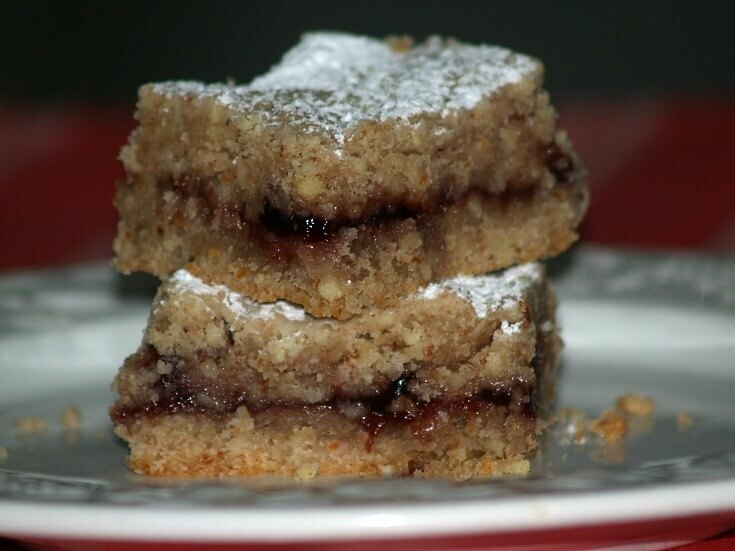 Sprinkle with powdered sugar; cut into bars. NOTE: These are very rich cookies. I like to cut them in very small pieces. Combine baking soda, flour and salt in medium bowl; set aside. Beat butter, brown sugar and sugar in a large bowl on medium speed until blended. Beat in eggs and vanilla until light and fluffy; add flour mixture and blend in on low speed. Fold in the chips and pecans until mixed thoroughly. Drop teaspoonful of dough 2 inches apart on ungreased cookie sheets. Bake 10 to 12 minutes or until edges start to brown; cool 2 minutes on cookie sheets. Remove cookies from sheets to rack to cool completely. Makes about 70 cookies. No cookie cutters? 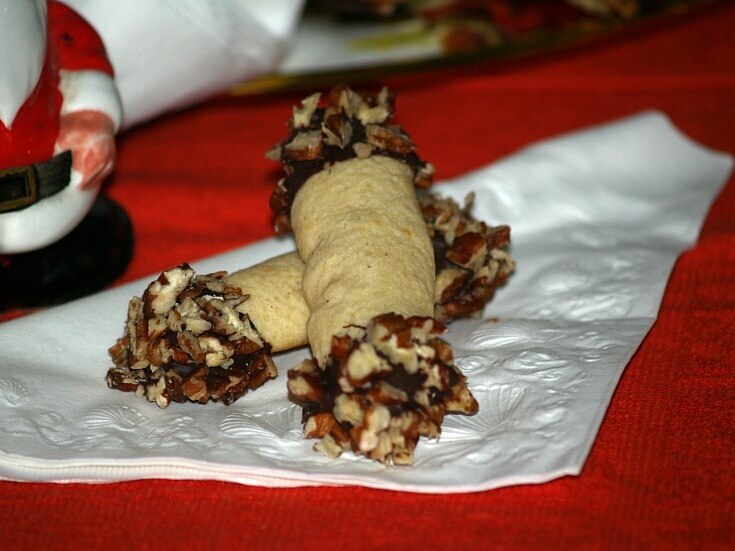 This recipe is for you to help get you started in making Christmas cookie recipes. Cut rounds with a biscuit cutter, glass, jar lid or anything round. Cream butter and sugar; add vanilla and eggs beating well after each. Sift together dry ingredients; gradually add to creamed mixture. Cover with plastic wrap and refrigerate dough about 2 hours. PREHEAT OVEN TO 375F degrees; line baking trays with parchment paper. On lightly floured surface roll dough to ¼ inch thickness; cut in rounds. Place on prepared baking sheets; bake 8 to 10 minutes. 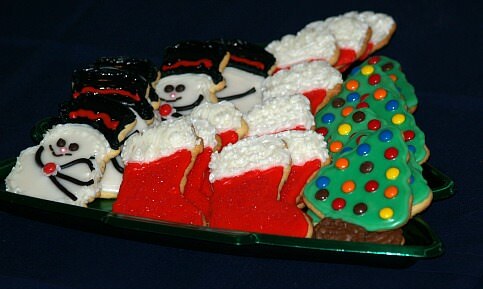 Cool cookies completely on wire rack; frost (recipe below) and decorate as desired. Combine butter and powdered sugar; with mixer beat in enough milk for spreading. Divide icing and tint as desired to decorate Santa’s/Christmas bulbs.